(The Rhode Island Subsea Sector is profiled in the March 2013 edition of Marine Technology Reporter. 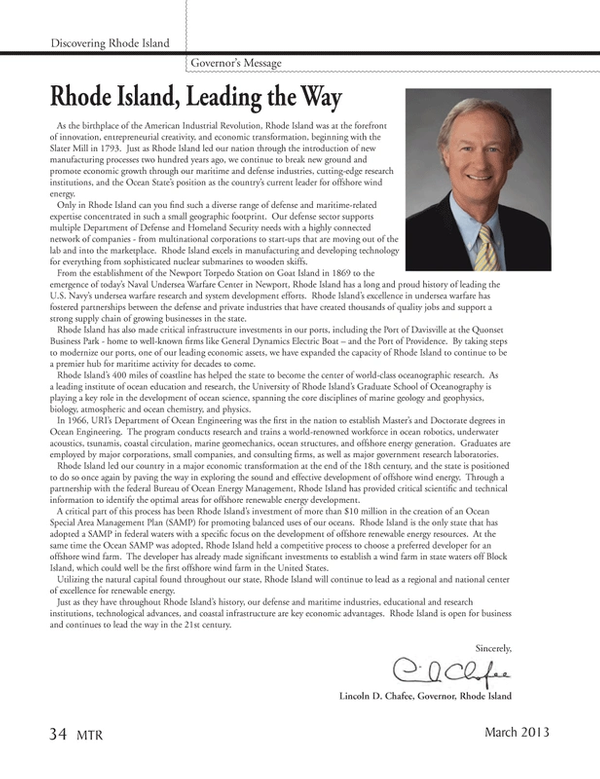 Rhode Island Governor Lincoln D. Chafee offers insights on the wealth of opportunity found in his state). As the birthplace of the American Industrial Revolution, Rhode Island was at the forefront of innovation, entrepreneurial creativity, and economic transformation, beginning with the Slater Mill in 1793. Just as Rhode Island led our nation through the introduction of new manufacturing processes two hundred years ago, we continue to break new ground and promote economic growth through our maritime and defense industries, cutting-edge research institutions, and the Ocean State’s position as the country’s current leader for offshore wind energy. Only in Rhode Island can you find such a diverse range of defense and maritime-related expertise concentrated in such a small geographic footprint. Our defense sector supports multiple Department of Defense and Homeland Security needs with a highly connected network of companies - from multinational corporations to start-ups that are moving out of the lab and into the marketplace. Rhode Island excels in manufacturing and developing technology for everything from sophisticated nuclear submarines to wooden skiffs. From the establishment of the Newport Torpedo Station on Goat Island in 1869 to the emergence of today’s Naval Undersea Warfare Center in Newport, Rhode Island has a long and proud history of leading the U.S. Navy’s undersea warfare research and system development efforts. Rhode Island’s excellence in undersea warfare has fostered partnerships between the defense and private industries that have created thousands of quality jobs and support a strong supply chain of growing businesses in the state. Rhode Island has also made critical infrastructure investments in our ports, including the Port of Davisville at the Quonset Business Park - home to well-known firms like General Dynamics Electric Boat – and the Port of Providence. By taking steps to modernize our ports, one of our leading economic assets, we have expanded the capacity of Rhode Island to continue to be a premier hub for maritime activity for decades to come. Rhode Island’s 400 miles of coastline has helped the state to become the center of world-class oceanographic research. As a leading institute of ocean education and research, the University of Rhode Island’s Graduate School of Oceanography is playing a key role in the development of ocean science, spanning the core disciplines of marine geology and geophysics, biology, atmospheric and ocean chemistry, and physics. In 1966, URI’s Department of Ocean Engineering was the first in the nation to establish Master’s and Doctorate degrees in Ocean Engineering. The program conducts research and trains a world-renowned workforce in ocean robotics, underwater acoustics, tsunamis, coastal circulation, marine geomechanics, ocean structures, and offshore energy generation. Graduates are employed by major corporations, small companies, and consulting firms, as well as major government research laboratories. Rhode Island led our country in a major economic transformation at the end of the 18th century, and the state is positioned to do so once again by paving the way in exploring the sound and effective development of offshore wind energy. Through a partnership with the federal Bureau of Ocean Energy Management, Rhode Island has provided critical scientific and technical information to identify the optimal areas for offshore renewable energy development. A critical part of this process has been Rhode Island’s investment of more than $10 million in the creation of an Ocean Special Area Management Plan (SAMP) for promoting balanced uses of our oceans. Rhode Island is the only state that has adopted a SAMP in federal waters with a specific focus on the development of offshore renewable energy resources. At the same time the Ocean SAMP was adopted, Rhode Island held a competitive process to choose a preferred developer for an offshore wind farm. The developer has already made significant investments to establish a wind farm in state waters off Block Island, which could well be the first offshore wind farm in the United States. Utilizing the natural capital found throughout our state, Rhode Island will continue to lead as a regional and national center of excellence for renewable energy. Just as they have throughout Rhode Island’s history, our defense and maritime industries, educational and research institutions, technological advances, and coastal infrastructure are key economic advantages. Rhode Island is open for business and continues to lead the way in the 21st century.